As footnote to a previous Greenbriar post that tendered Treasure Of The Sierra Madre in color (a candid from the location), here is further sample I received from esteemed author and historian Mark Vieira, whose image acquired years back from a New York dealer had faded since, but revived thanks to Mark's adroit digital fix. I recognized the still from having bought same at an 80's Manhattan meet of poster fiends, one of long-ago gathers when it was still possible to find great stuff at rates below lunatic level collectors now cope with. The seller was one Ken Galante, now deceased, who by all appearance vacuumed every still lab and storage depot in the Northeast. He had thousands of images never seen elsewhere. I went to Ken's loft once and saw stuff almost scary for rarity. Wonder whatever happened to it all ... original photos Ken and others like him sold for five dollars now get four and five hundred at auctions and E-Bay. 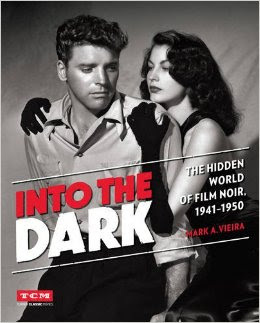 Back to topic of Mark Vieira, he has a new book coming May 24, Into the Dark: The Hidden World Of Film Noir, published by Turner Classic Movies. I have seen a preview and it is spectacular, the reproduction of images setting new standard for quality, Mark's prose great after fashion of his previous books. Pre-orders are now available at Amazon. 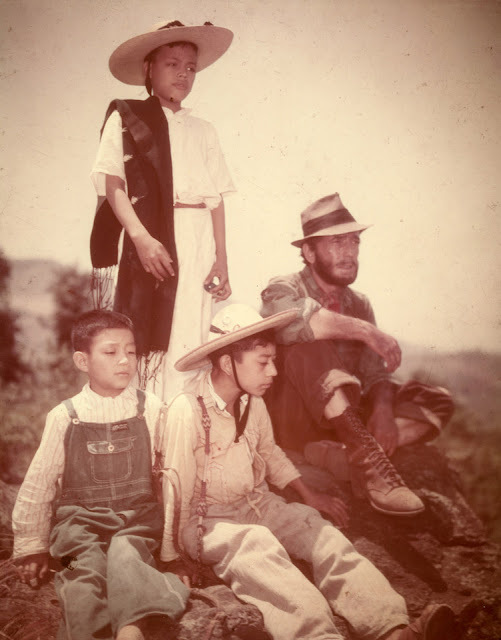 Kodachrome was never a good match for people shots, let alone when it's overexposed under a bright Mexican sky. Landscapes? That's a different story. Combining slow film speeds (25 ASA), varying skin tones and manual exposure methods is a recipe for, if not disaster, a very long slide show. Maybe Bogie actually made it to Mexico for 'Treasure of the Sierra Madre', but I can tell you the gila monster scene, Howard's little jig and the Federales chasing the banditos were all filmed in Kernville.